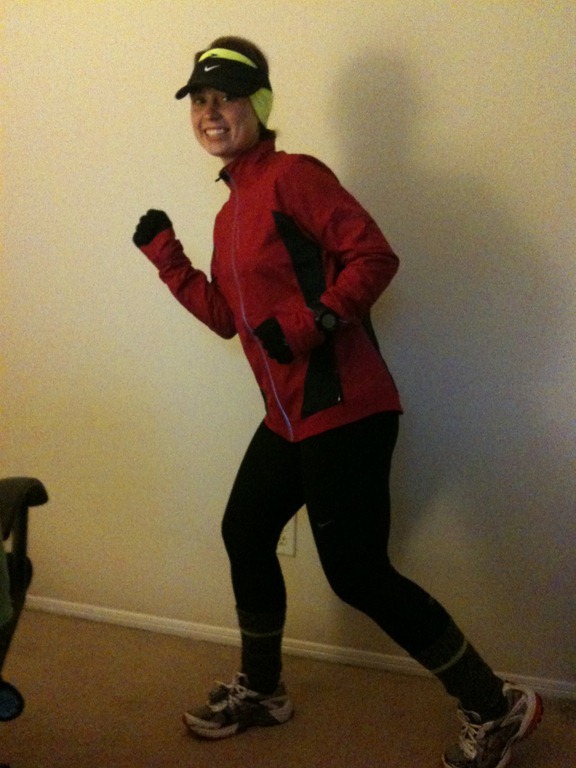 I believe the days of running tights, gloves, and headbands are behind us. Before my snow run a few weeks (?!) ago. At least they are here in North Carolina. 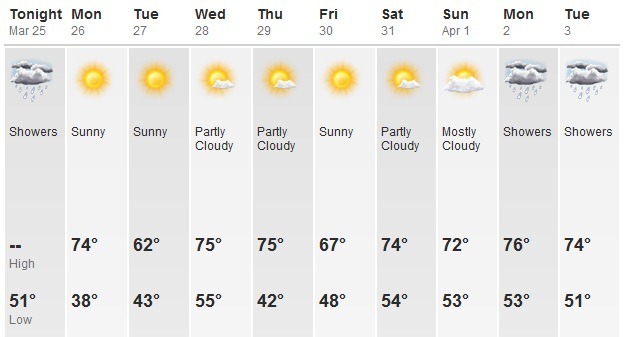 The weather for the upcoming week looks promising! Yesterday was my first run since the half and it was a hot one. 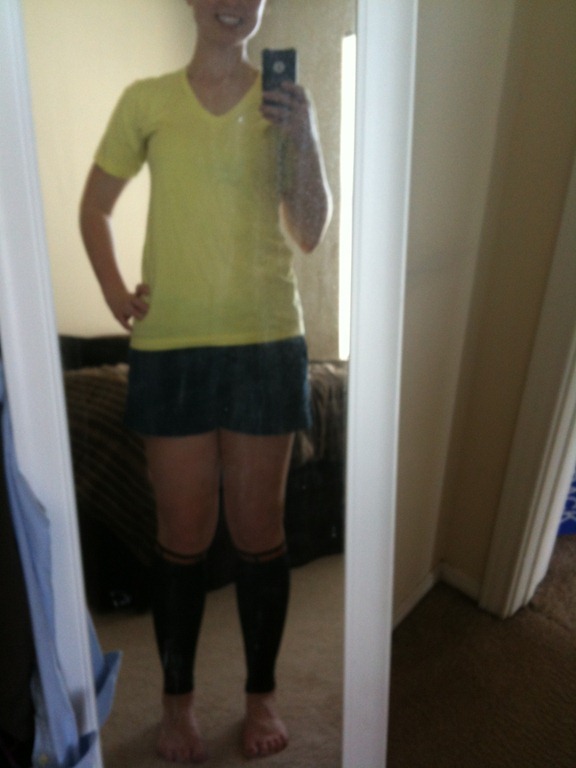 I got to wear shorts for the first time since…the marathon? and it felt darn good to feel the wind against my legs. I didn’t know how far I wanted to go, or how long the rain would hold out, so I set off towards the park and had an easy 5 mile run. It was nice to be running the park again. I’d been running on sidewalks during this past “training” period since it’s safer than the park when it’s dawn/dusk. I’ll take the longer days we’re having along with that nice weather, too! 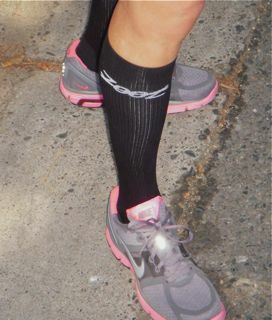 After the run I did my usual stretch/cool down, shower then pulled my new compression sleeves from the NYC Half expo. I love that I can discreetly wear these under work pants during training this summer for the MCM. The fact that were free is an added bonus! Last week’s recovery after the half went well. I had hip pain after the race last Sunday, but after thoroughly icing it overnight, I woke up to a seemingly perfect hip! It hasn’t given me any trouble since and I’m really happy about that. By Wednesday/Thursday I was able to take the stairs down looking pretty normal and without a look of agony on my face. The few days following the race I was taking them backwards..does wonders for those sore quads! Today was more of a relaxing day. I did some yoga and pilates at home while Brandon was working, then rounded out the day with a walk with Owen and some chores around the house. I can’t wait to get back into a normal exercise routine this week! What are your workouts looking like? Any ideas for me to spice it up? As far as I’m concerned, this past week was pretty freakin’ amazing. 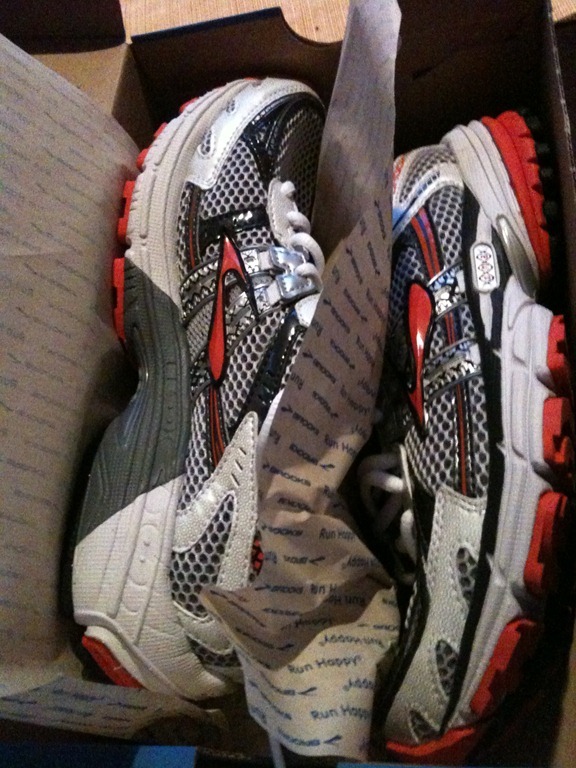 Did I ever show you my new Brooks Ravenna 2 running shoes? Love them more so than the Ghost 4’s or Adrenaline’s. Highly recommend them. I ran Monday for 4 miles (furthest since the marathon) without ANY pain the next day. I’ve never really had pain during my runs since I began running again in January, but the day after is always my tell-tale sign of my progress, so it was encouraging to be pain-free the following day. I have a new routine when I run starting with a dynamic warm-up my PT taught me. (Here is one similar from Runner’s World.) This helps warm up my muscles before they have to do so much work. After I run, now I do a series of static stretches, shower, foam roll, and ice my hip for 15-20 minutes. 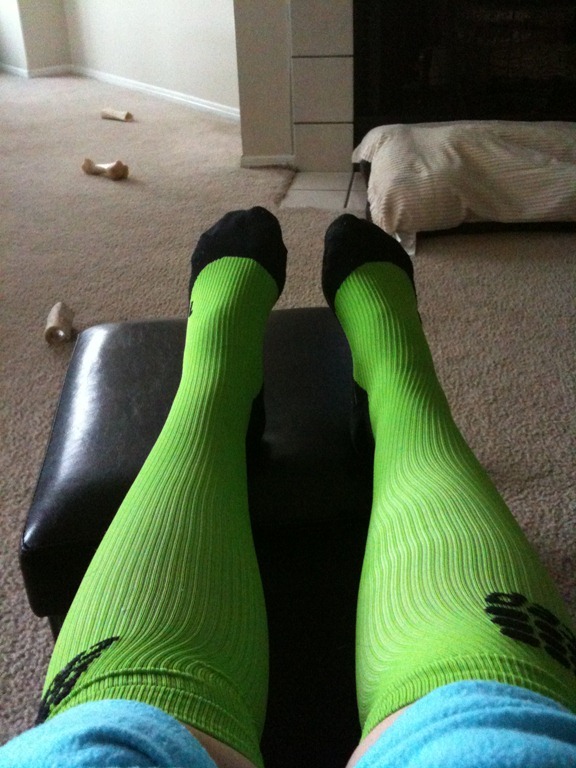 Then I normally pull on my compression socks to help speed recovery. I also normally sleep in them, I just love the way compression feels! So far, this routine has really worked for me and I’m loving how it’s enabling me to run again. Ever since I began PT I’ve been making gains, but 2 weeks ago when I started going twice/week I feel like I’ve really gained traction. When Justin (my PT) pinpointed my pain last week from the treadmill, and during manual manipulation, that was my last run on the thing. Since then I’ve run outside and haven’t had any pain. Wednesday I ran 4.83 miles and it felt amazing. It was a little late after I got out of work so the majority of the run was in the dark, but I have my trusty nightlife running shirts to make me be seen. That run was the most fun I’d had since the marathon with running. I felt so strong and free to be running so far. I also had no pain the following day. Thursday I went to PT and we did more strengthening exercises. I’m working on balancing exercises too to recruit and strengthen my accessory muscles that support my powerhouse muscles when I run. Justin told me it’s time to try running two days in a row now since we’re 4 weeks out from the NYC Half Marathon. Up to this point I’ve been running every other day. My instructions: I was to run 2 days in a row over the weekend, with the first day being the longest of the two runs. 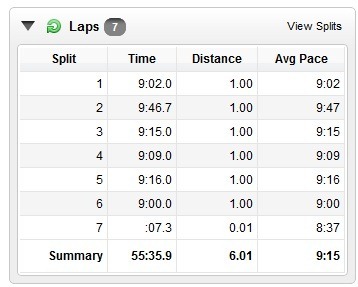 Saturday I pulled out a 6-miler on a beautiful 60 degree, sunny day. So perfect. The dreaded mile two. I always make up for my zealous mile 1 start. That run felt great and I had a little pain last night, but nothing like I used to have. I iced twice last night and felt fine this morning. 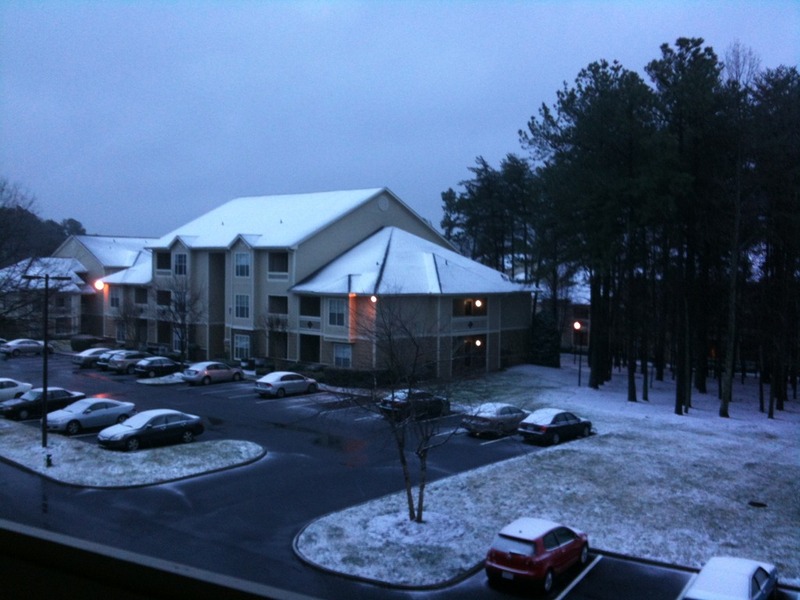 Today, I ran 2 miles in the snow! 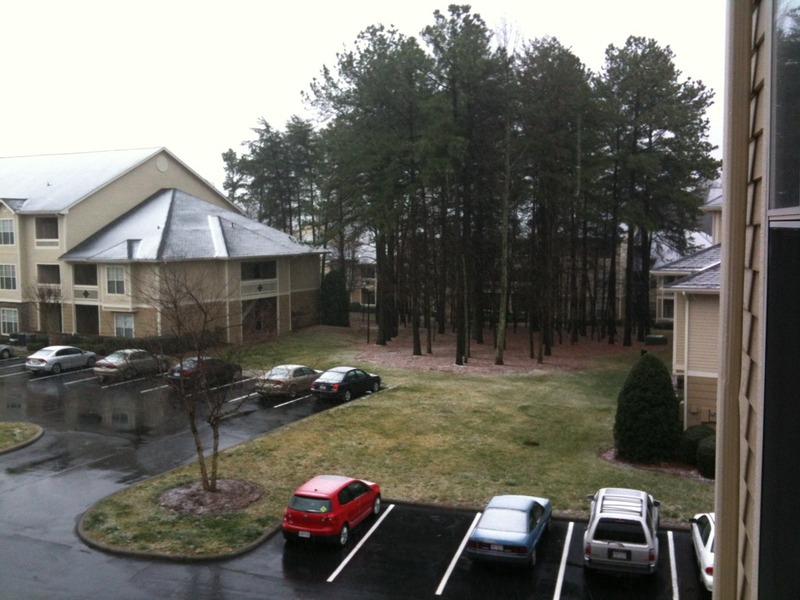 It was my first run ever in the snow and it was actually really fun. It had been raining all day so when it turned to snow I thought this would be my best chance of the day to get a run in. 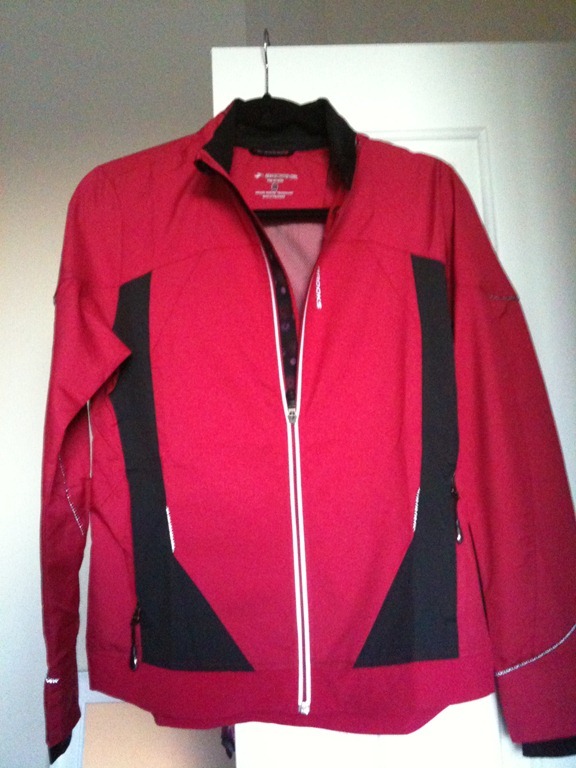 My first run in my new running jacket, too! Fleet Feet had a winter blowout sale on Friday and I snatched this beauty up. I love it! Very good at keeping me dry. 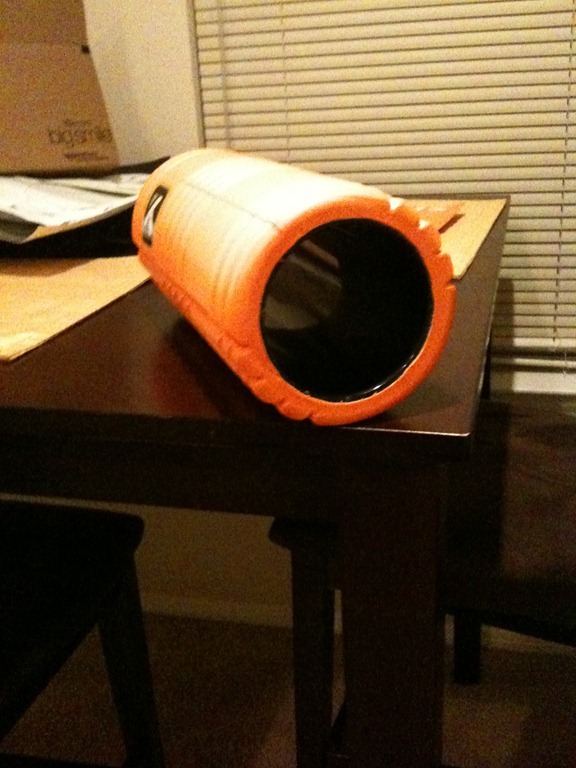 Speaking of all this running gear, I got a new foam roller! I knew I wouldn’t be able to bring my first foam roller with me to NYC..
It’s a bit..huge and wouldn’t fit in my carry-on luggage. 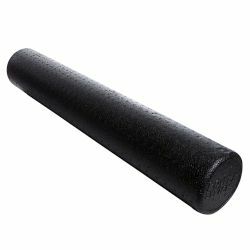 So I was on a mission to find a travel-friendly foam roller and have had this one in mind since fall. The Grid. 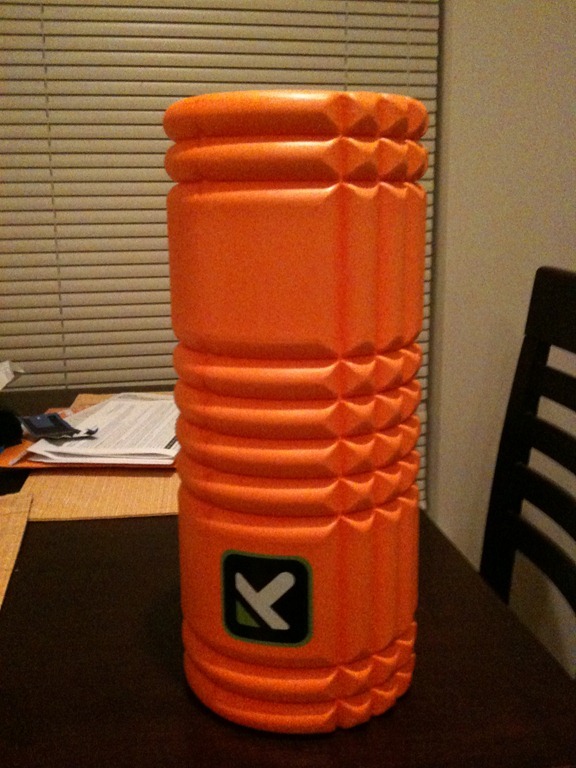 There are different textures on this foam roller vs. my original foam roller which I was skeptical about. The squares are supposed to feel like fingers, the longer ridges are tubular feeling, and the flat feel more palm-like. As you can see, it’s hollow, so I can stuff socks and other running stuff inside and still have room for other necessities in my luggage. It’s also only 18” long. So far I love it. I can actually tell a difference in the amount of pressure and it gives me a little deeper of a massage when I use the fingertip areas to get into those really tight areas that need worked out. This upcoming week is my 6th week of physical therapy and is supposed to be my last. I may stretch it out another week or two and I’ll definitely come back after the half marathon in case I have any pain so he can work that out for me. I cannot recommend a good physical therapist enough! I was definitely skeptical after not seeing any major progress for the first 2-3 weeks but then it’s like it all clicked for me. My PT is also a runner, so he gets it. In less than a month, I’ll be running the NYC Half. I really believe I will be able to run it. Maybe I’ll have to run/walk it and that’s fine if I do, but I’m getting pretty excited about the possibility of running the entire thing. Did you know there will be members of the USA Olympic Marathon team running this race? I SO hope to see Kara Goucher and Desiree Davila. Two of my role models. 20-something’s are still allowed to have role models, right? Here’s to another positive week ahead! It’s been one week since I ran my first marathon. Well.. a lot better than I thought, actually. This is me and I’m excited!! The drive home to Greensboro from Savannah on Sunday went pretty well. Since I was a passenger, I had plenty of time to massage my quads/hamstrings for the 6+ hour drive home. Thank goodness for that. 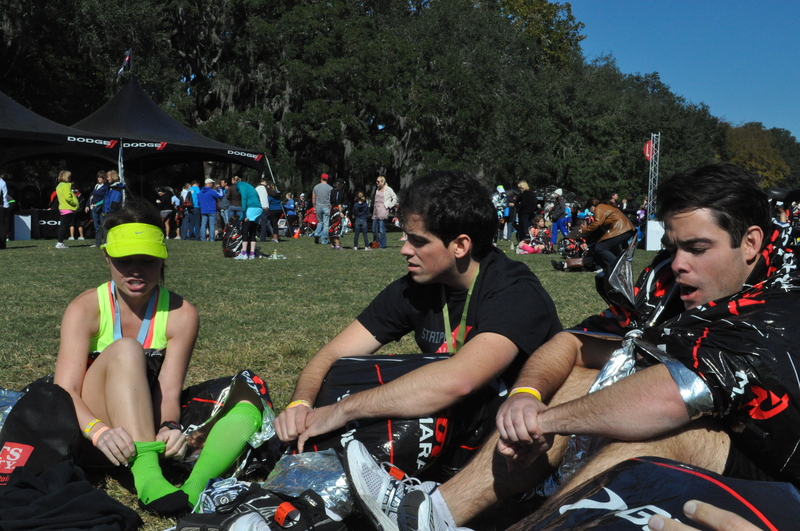 You may have seen me putting on my compression socks after the marathon.. I will swear by these as long as I run. They work. I debated for 8 months whether or not to buy these and I wish I hadn’t waited so long. They’re amazing, and I had NO calf/shin/ankle/foot soreness after wearing these. See a scientific review here and my thoughts on these earlier in the year here. I wore the socks from 30 minutes post race – 36 hours after. Delayed Onset Muscle Soreness set in. It was the most painful day of recovery, ever. Hands down. I walked funny, I avoided stairs, I did not bend down to pick anything up. I seeked handicap ramps into buildings on campus to avoid stairs. When I had to attempt stairs, I ended up breaking into a sweat and on the verge of tears. I think I got some pretty weird glances at work, but whatever. I ran my heart out, I’m not sorry. I should mention that Brandon ended up with a stress fracture in his foot and came home from Savannah with a boot. This meant I would be taking the dog out, every time, up and down 36 steps. Thank goodness my mother-in-law was here Monday and Tuesday to help me with this painful task. When I did take the pup out, I took the stairs backwards. You may look crazy or like you’re 85, but it sure beats crying as you walk down a flight of stairs. I came home from work that day and immediately foam rolled for 30+ minutes. Another invention that has boosted my quality of life during training. More relief. I could take the stairs up, but coming down was still quite a task. I massaged my quads, foam rolled when I got home from work, but overall it was a great improvement from Monday. Feeling more confident with stairs. Up was no problem and down was progressing towards normal. After work, my friend Tyna met me at campus for a run. This was the first day of running for me since the marathon and is really the first advised day of running, per Hal Higdon. We went for an easy, slow 3 mile run. My pace was near 11 minutes/mile. Holy Moley. All that damage to my muscles was showing. It felt good to get back out there though. I had some left hamstring pain during the run and some right foot pain.. I stretched out the pain of my hamstring and kept going, but eventually I became concerned about my foot pain and called it quits at 3 miles. I was fine with that and came home to rest and ice it. 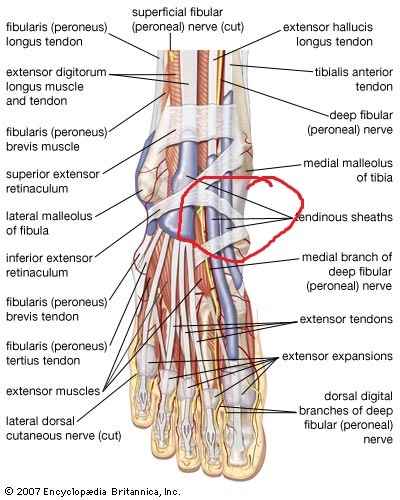 Foot pain still present, hips feeling a little out of line or something.. Tired of not getting any physical activity other than walking at work, I went to the gym for Spin class. It was non-impact so I didn’t have to worry about my hips or foot, I could still get a good cardio workout in, and felt semi-normal for having some kind of exercise on a Saturday morning. I can tell I will miss my long runs if I can’t get back into them soon. Other than that, recovery has been going well. I’ve been adapting my eating to mimic how much exercise I’m doing. That has actually been easier than I thought it would be. During training I was eating A. LOT. I was burning a lot of calories and therefore, had to eat more to fuel. Now that I’m not running 25-30+ miles per week, I my appetite has markedly decreased. I’m not craving simple sugars (desserts) as much as I was (for calories) and I am relatively at a good place with calorie balance. I am SO EXCITED to not have a plan, for once this year. 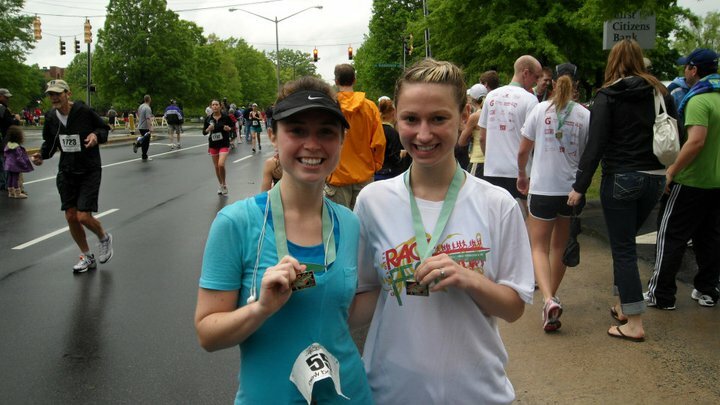 Let me remind you that 2011 started off with training for my first half marathon in April. Training starting in late January-April. 2 months off from training, had me preparing for marathon training. 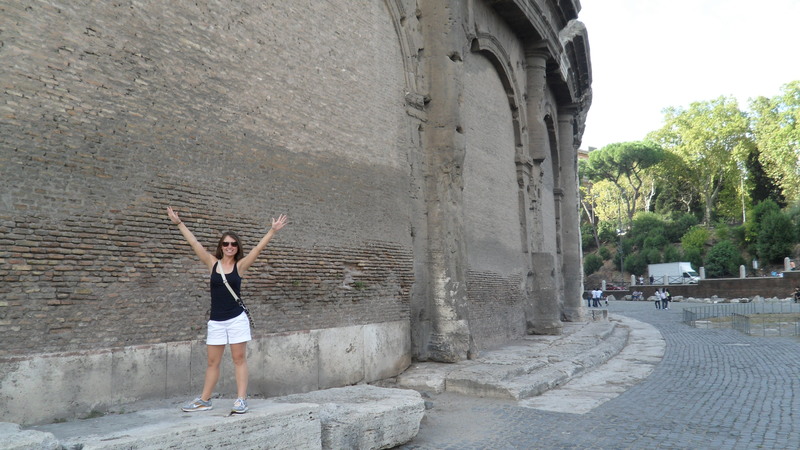 July 5, 2011 Marathon Training Began. I have not been training for a race for a grand total of 3 out of 11 months of 2011. I’ve made great gains this year. I’ve developed as a person. I have more self-confidence than I ever have. 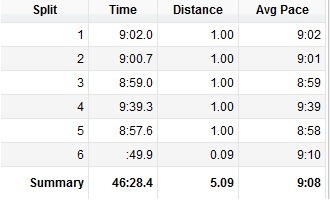 To finish out 2011, I have a goal to complete at least one more race. For fun though, not to set a new PR (personal record). It could be a 5k, 10k, half marathon, whatever. I just want to do one more before 2011 wraps up. My goal for winter is to incorporate more yoga into my weekly exercise routine. I need the flexibility and I loved it when I did it for a few weeks back in May. I felt so strong, so centered. I just want to do what I feel like doing, in the form of exercise. If I want to do elliptical for 45 minutes, I’ll do it. If I want to take a Spin or Body Pump class, I’ll do it. I love the holidays and I’ll still run, but I’ll do it because I love it, not as part of a plan. I’m looking ahead to 2012 and looking at which races I’ll be participating in. A few I have in mind are: Cooper Bridge Run, Rock ‘n’ Roll Nashville, The Flying Pig, The Indianapolis Mini Marathon, The Chicago Marathon and maybe the Rock ‘n’ Roll Savannah Half Marathon. No matter what happens, I know I’ll be running. Here’s to finishing goals, coming out stronger, and setting new goals to look forward to!! This is how much of a nerd I am. It can be used to confirm your threshold pace and what your proper pace should be during a race. Lactic acid in blood means not enough oxygen is delivered to muscles, therefore you could be overtraining. Not that I’m actually going to buy this, but this is the type of stuff I got to play with for my second degree at Purdue; Nutrition, Fitness, and Health (Exercise Physiology based). *sigh* I need to go back to school to fulfill my inner-nerd. I get too excited about this stuff. I’ve been reading more about compression socks (because I’ve been fascinated with them since I first read about them in February) and am trying to decide if they are worth the dough. They have been used for years in the medical field for preventing blood clots and improving circulation and are now becoming popular in the athletic world. 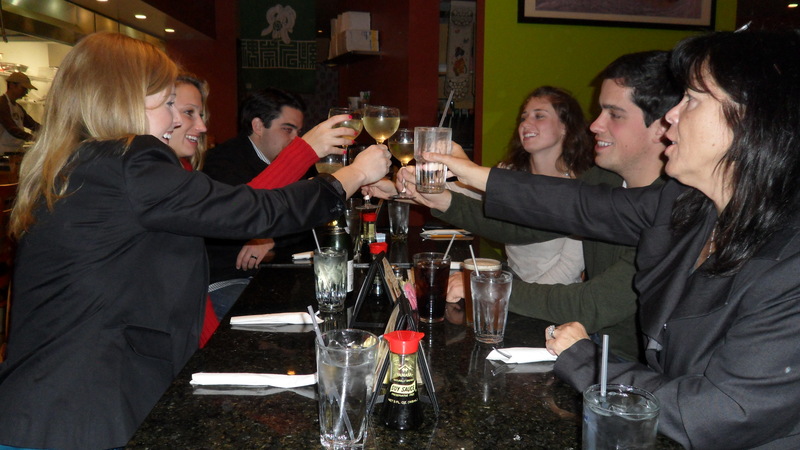 There are several brands out there but one that always gets the best reviews are Zoot’s. I’ve read peer-reviewed research articles about their benefits and there does seem to be scientific evidence of helping speed up recovery from endurance events. Hello, marathon training? This guy did a full scientific review on a pair of Sigvaris compression socks. If you don’t want read all about it there, I’ll hit the main points. Increased blow flow return (to the heart) when wearing compression socks. This happens because the compression prevents blood from pooling in your lower legs due to gravity. This would help increase stroke volume (more blood pumped from heart each time the heart beats, therefore making oxygen delivery more efficient) and increase clearance of by-products from exercise to prevent buildup and decrease soreness in the recovery phase. This is what I’m so interested in. Muscle vibration. Stating that the vibration from your foot striking the ground causes delayed muscle soreness and the compression socks could help decrease the soreness by improving our efficiency. 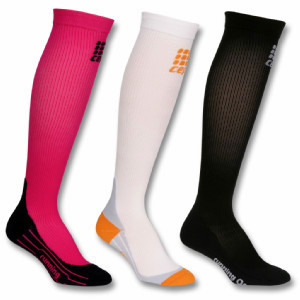 Some research conducted on compression socks also has to do with blood lactate levels. They have been seen to reduce the amount of blood lactate levels, not muscle lactate levels. Maybe the increase in blood flow increases the efficiency oxygen is delivered to our working muscles and therefore decreasing the amount of lactic acid that is produced. This would be a marker to know that we still have “some go” left in us. Lactic acid is produced during exercise when our oxygen demand is greater than the oxygen we have available to fuel our muscles and metabolic functions. When this oxygen deficit occurs, lactic acid is produced. 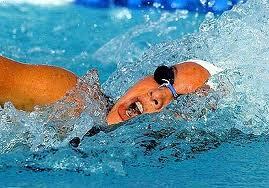 It’s what causes the burning sensation in our muscles during intense exercise because lets face it, its lactic acid. Here’s the part people miss – lactic acid is completely washed out of your muscles within 30-60 minutes of finishing your exercise1. Since the soreness you experience from that exercise doesn’t show up until 1-3 days after you’ve finished.. how can we blame lactic acid? Those chemical irritants are some of the by-products that *may* be cleared faster when using compression socks. I don’t know but it’s a theory. How do you get rid of soreness? Start. Moving. Don’t sit on the couch all day. 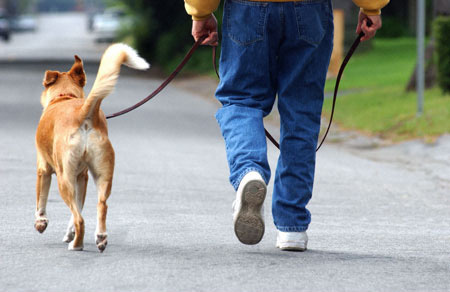 By walking, swimming, or doing some other event other than the exercise that made you sore to begin with, you begin to restore your muscles to their normal state. This is why Sunday is my cross-training day! Continuing to stretch and time in hot baths or saunas can help, too. You can’t always prevent yourself from getting sore, but by continuing to be active will increase your strength and endurance and increase the tolerance your muscles can handle. Compression socks could also help with this swelling and recovery due to the compression alleviating that swelling and inflammation. Think of when you smash your finger, you want to apply pressure to help with the pain. 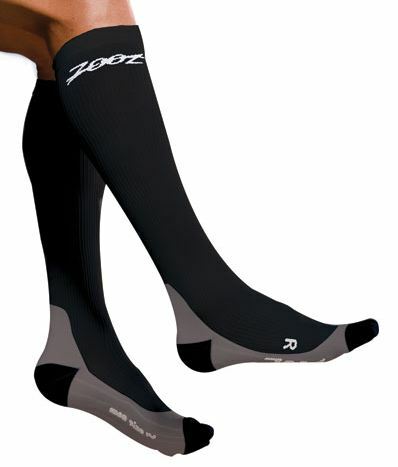 The compression socks can be used in 2 ways, during the endurance event or during the recovery phase. The research for use during the event isn’t as reliable. It won’t make you faster, but it could help with the vibration aspect. Most of the research that proves beneficial is in the recovery phase. That’s when I would use them and on long rides before races, aka Savannah. I’m not sure how cool I would look running in socks up to my knees (or in my case, my thighs because my legs are so short) in 90 degree weather, anyway. I still haven’t decided if I’m going to buy them, but I guess I just want to, to see if they will work to speed up recovery between my runs. 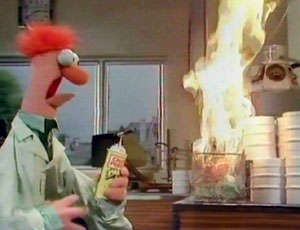 Be my own science experiment – sounds good in theory anyway! How do you recover from long runs?